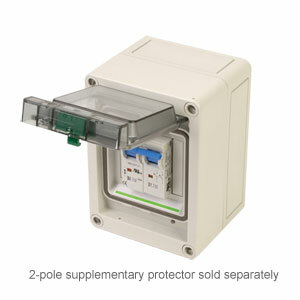 The EK Series polycarbonate enclosures are a unique design to house and protect standard IEC components, such as DIN rail mount circuit breakers, timers, switches, meters and other control devices. The unique cover design features a shrouded cut-out and transparent hinged doors with push release doors latches, for quick access and visibility. The shrouded cut-out, spanning the width of the cover, exposes mounted components for easy adjustment and isolates wiring for increased safety. Note: Comes complete with 35 x 7.5 mm DIN rail and label included.